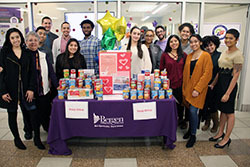 PARAMUS, N.J. – The Bergen Community College student government association used soup to bring warmth to the winter season for those in need. During the week of “Giving Tuesday” Nov. 27, the group sponsored a soup drive supported by students, faculty and staff that ultimately delivered 163 cans to the Center for Food Action pantry at the College. Temple University and Wisconsin Hope Lab researchers estimate 42 percent of community college students face hunger or “food insecurity,” defined as lacking reliable access to a sufficient quantity of affordable, nutritious food.